Sometimes the easiest gift is not always the yummiest. I like to find unusual or at least 'not the norm' types of food gifts for the Holidays. Usually I bake, and I bake, and well...I bake some more. This year could be different. But I did find some yummy stuff! 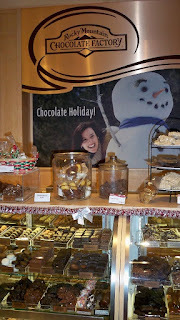 While the chocolates may basically compare to most other Chocolate places they do have something I find extra tasty! That's their dipped Apples. Many flavs to choose from. 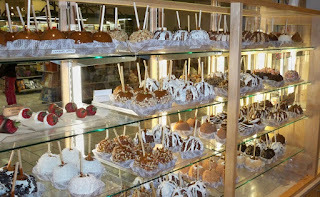 My favorite is the Green Apple dipped in Caramel first and then Chocolate. It's got that sweet from the Chocolate and pucker from the Green Apple. They also have a descent selection of Sugar-Free candies, Chocolate Dipped Strawberries, Chocolate dipped Marshmallows and more! Have you ever received Food gifts that you'd love to chuck but are afraid the person may find out so you take them home and hold on to them until it's no longer up for discussion? LOL. Yep. Then don't give them LOL. Here's a suggestion. Maybe you know someone that likes soup, a lot. Try this out... A nice basket with a couple of funky soup bowls, soup spoons, Crackers and or toppings, and here's the cool part.. A gift certificate to the nearest Safeway! They have their own brands of soups called Signature Cafe. Some of the flavors include Fiesta Chicken Tortilla (2 Yums up), Cravin Crab & Sweet Corn Chowder (2 Yums up), Asian Style Chicken Noodle and more! The reason I suggested Safeway is because these soups come in resealable containers and one container will last one person at least a couple of meals, maybe more! Use other items for baskets. Like Decorator boxes, Decorated Pots (you can find one at a Thrift Store that you can Fab up) or those wonderful wire numbers you can usually find in the back of Ross, Marshalls, TJMaxx and other stores like that. Another great idea is to give a basket (or box) with a recipe and all of the ingredients needed to make a certain dish. Especially if its a dish you normally make and know the receiver enjoys. Add the recipe to a small decorated notebook so the receiver can keep track of that and other recipes. Know someone that loves Sandwiches? A basket with a couple of types of bakery breads, (not the regular sandwich loafs), sandwich fixins' like oil & vinegar, mayo, specialty items like spicy mustard and olive tapenade, a couple of those sandwich containers (you know the ones that are just big enough for a sandwich) and a gift certificate to a nearby butcher shop make a perfect gift! Do you have any ideas about Food Related Gifts? We'd love to hear them.